Villa Armi is set on a hill in a olive field providing unspoiled views of the surrounding landscape. The natural environment is ideal for relaxing and offers an abundance of privacy. The villa offers all kinds of outdoor facilities including a private swimming pool, privately tended garden, verandas, and a large yard with a hen house providing fresh eggs during your stay. 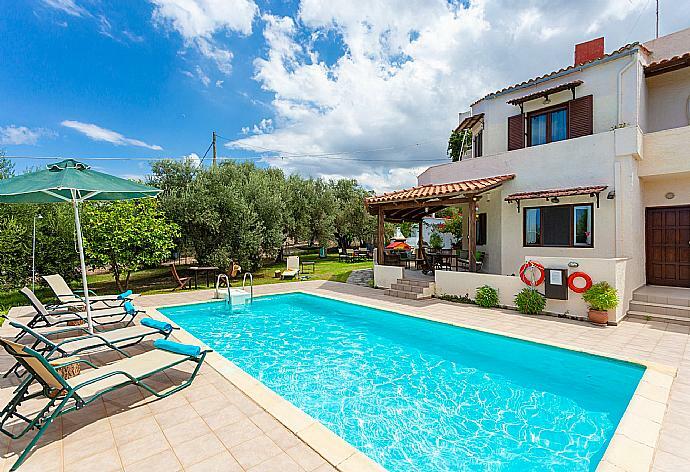 On the ground floor of the villa there is an open-layout living and dining area, fully equipped kitchen, a double bedroom, and a family bathroom with shower and washing machine. On the first floor there are two double bedrooms, a twin bedroom, and two family bathrooms (one with shower and one with a bath). All bedrooms have their own private balcony with fantastic views of the sea and mountains. Additional Pool Features: Pool Shower, Poolside Dining Area, Sun Beds, Pergola, Sea Views and Sunset Views. There is also a Barbecue. Episkopi is a small, traditional village and home to longest sandy beach in Crete and overlooks the green and fertile valley of Mousselas river. Episkopi Beach is 3.5km long, sandy, shallow and mostly wavy, like most beaches in North Crete. Along the beach you can find places with lifeguards, showers, changing rooms, umbrellas, snack bars, and water sports. The surrounding area is a well organized and has many restaurants, taverns, and bars.